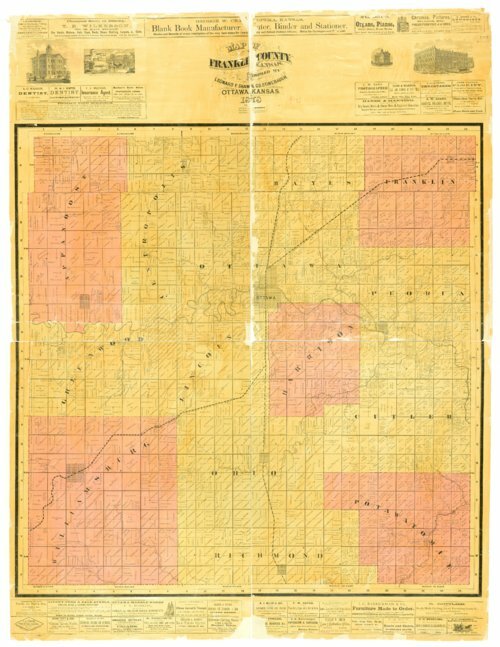 This map compiled by Leonard F. Shaw & G. D. Stinebaugh shows the townships and towns in Franklin County, Kansas. Some points of interest include: the names of landowners within the townships; the principal routes of the Kansas City, Burlington & Santa Fe Railroad; the Leavenworth, Lawrence, & Galveston Railroad; and the Kansas City & Santa Fe Railroad. At the top and bottom portions of the map illustrations of historical landmarks and advertisements from local businesses are visible.